B&O’s first MP3 player, the BeoSound 2 was a basic MP3 player designed for use with both MP3 and WMA files. 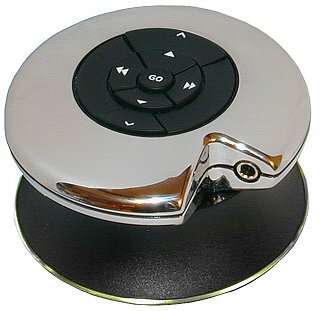 It consisted of the player which was a stainless steel disc 73mm in diameter and 23mm thick with a rubber keypad on the top surface very similar in design to that of the Beolink 5000 and Beo 4 remote controls. Text copyright © Beocentral. Unauthorised reproduction prohibited. These keys allowed all functions to be carried out by touch and the control could rapidly become second nature. This was just as well as the BeoSound 2 lacked the display fitted to most other players at this time. Text copyright © Beocentral. Unauthorised reproduction prohibited. The docking base was a combined charger for the Lithium battery and also acted as the connector to the computer source. The base of the station had a system of coloured lights to keep one informed of the charging and data transfer processes being undertaken. Text copyright © Beocentral. Unauthorised reproduction prohibited. The system was supplied complete with software to allow the transfer of music tracks to the unit as well as a pair of A8 earphones. A 128MB SD Card was also supplied which allowed the contents of up to 5 CDs to be downloaded at any one time. Cards up to 512MB were available with a promise of more to come. Text copyright © Beocentral. Unauthorised reproduction prohibited. The battery would last for up to 10 hours depending on the volume selected. Text copyright © Beocentral. Unauthorised reproduction prohibited. No control over the sound balance was possible on either the player or using the software though it was possible to use other non B&O software should one choose. Text copyright © Beocentral. Unauthorised reproduction prohibited. A very high quality though basic machine, the BeoSound 2 was none the less extremely expensive compared to its better specified rivals but none could match the tactile quality of the B&O product. Text copyright © Beocentral. Unauthorised reproduction prohibited.